CHARLESTON, S.C. (September 1, 2018) - West Virginia used a seven-run sixth inning and a quality start from Ike Schlabach to cruise to an 8-0 shutout win over the Charleston RiverDogs Saturday evening at Joseph P. Riley, Jr. Park. The sixth inning started with Calvin Mitchell rocking a home run over the right-field wall to double West Virginia's lead to 2-0. Next, Deon Stafford singled and Rodolfo Castro walked. After a sacrifice bunt from Raul Hernandez, runners were on second and third for Robbie Glendinning with just one out. The Power (34-31, 71-60) third baseman dribbled a ball into the left-field corner to score a pair and increase the Power's lead to 4-0. After that, Rafelin Lorenzo took Nolan Martinez (0-4) deep to right field for his third homer of the year, tearing the game open and extending the score to 6-0. The West Virginia offense was not finished there. After a pitching change, Lolo Sanchez and Connor Kaiser singled against RiverDogs (29-37, 62-72) reliever Austin DeCarr before Stafford smoked a two-run double to cap the scoring with the Power up 8-0. 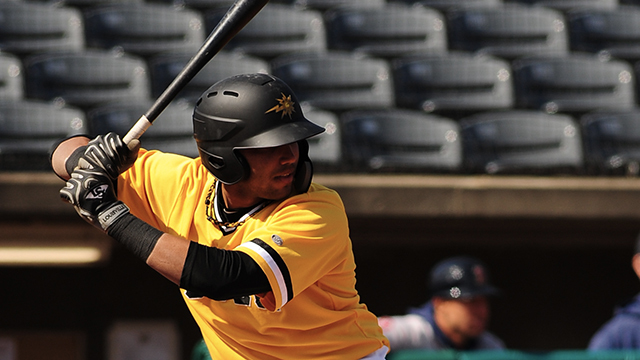 West Virginia scored seven runs in an inning for the third time this season and the first since the eighth inning on April 21 versus the Asheville Tourists. All of the offense may have overshadowed an excellent performance from Schlabach (8-4). The southpaw twirled six innings of scoreless baseball while only allowing two hits. The Ohio native fanned three batters in his second consecutive quality start. Max Kranick (S, 1) finished out the game, working three hitless innings in his first relief appearance for West Virginia. Kranick became the 16th Power pitcher to earn a save this season, the highest single-season mark in West Virginia Power history (2005-present). The Valley View High School product recorded his first professional save in his first relief outing since 2016. It did not take long for the Power to take their first lead of the game. Travis Swaggerty walked and moved to second on a wild pitch from Martinez. Kaiser sent Swaggerty to third with a single, and the center fielder scored on a Mitchell ground out to second that put West Virginia ahead 1-0. The Power continues their four-game series against the RiverDogs at Joseph P. Riley, Jr. Park Sunday night, with first pitch set for 5:05 p.m. LHP Oddy Nunez (1-0, 2.10 ERA) takes the hill for West Virginia, while Charleston counters with righty Shawn Semple (1-0, 0.00 ERA). Pregame coverage begins at 4:45 p.m. on The Jock 1300 and 1340 AM, as well as online at www.wvpower.com and via the TuneIn Radio App and MiLB First Pitch App. The Power is in a playoff push. Should they make the playoffs, Appalachian Power Park would host game one of the Northern Division Championship Series on Wednesday, September 5, at 7:05 p.m. For tickets and more information, call the Power at 304-344-2287 or visit wvpower.com.